Have ever been in a situation whereby you want to convert your PDF files to Doc but you cant? 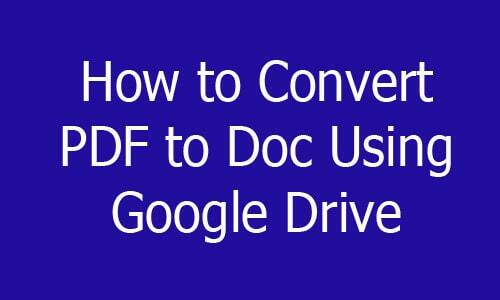 Do you know you can use Google Drive to convert PDF files to Doc? Portable document format which is popularly known as PDF was introduced by Acrobat. When PDF was introduced, it was used to share and transfer documents which include Images, Text messages and many more. In 2008, Portable Document Format(PDF) was made as an open standard that allows other software and service to create and view PDF files. Presently many people find it difficult to convert their PDF files to Doc using Google Drive. 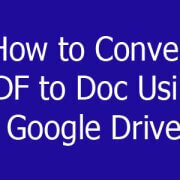 On this article, you will be enlightened on how to convert PDF files to doc using Google Drive. Kindly follow the below guide step by step to know how you can use google drive to convert PDF files to Doc. Before you begin the process make sure that you have a google account. You can create a google account if you don’t have. Also, ensure that you have an internet connection on your device. You can follow the below guide if you have the two requirements. Firstly, launch your web browser and visit the official Google drive platform. Sign in with your login credentials which are your Google ID and Password. Click on the “Gear” icon once you are logged in. Here, you have to choose the “settings” option then locate the “convert Upload” option. Now, click on “ Convert uploaded files to Google Docs editor format” option. You can now upload the PDF file, wait for some minutes so that the upload will finish. Once you are done with the upload, Look for the file and open it. Lastly, click on the “Open with Google Doc” to complete it. Having got this done you have successfully converted your PDF files to Doc using google drive.